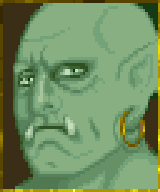 Gortwog, King of the Orcs and Lord of Orsinium is an Orc noble, leader of the Minat tribe, and ruler of the Orsinium Area. He is found at the head of the dining table in the Stronghold of Orsinium in the city of the same name. Barenziah's Book: Queen Barenziah wants to suppress an unauthorized biography. Gortwog also appears as the card Gortwog gro-Nagorm in Legends.